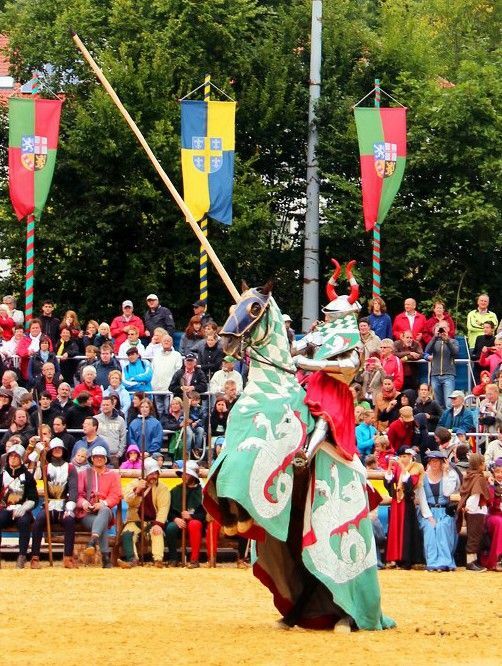 The Jousting Life: Interview with Per Estein Prøis-Røhjell: Jouster at "The Grand Tournament in Sankt Wendel"
Per Estein Prøis- Røhjell, called Pelle by many in the jousting community, was one of the jousters at “The Grand Tournament in Sankt Wendel”. Per and his wife, Hanne, run a riding school in Norway called Trollspeilet. Their appetites for the history of horseback fighting has led them to various places, sometimes astray, but Per has now found a path that leads toward the goal of being a realistically good mounted knight! He learns from a few different sources: he has studied with the Hofreitschule in Bückeburg, he has trained with Arthur Kottas Heldenberg of the Spanish Riding school in Vienna, and trains regularly with a Portuguese bullfighter and Working Equitation world champion. He finds that this mix gives him a deep insight in from several different angles – hopefully it will make him dangerous on the field of battle as well! Per aka Pelle was kind enough to take the time to answer a few questions about his experiences during “The Grand Tournament of Sankt Wendel”. 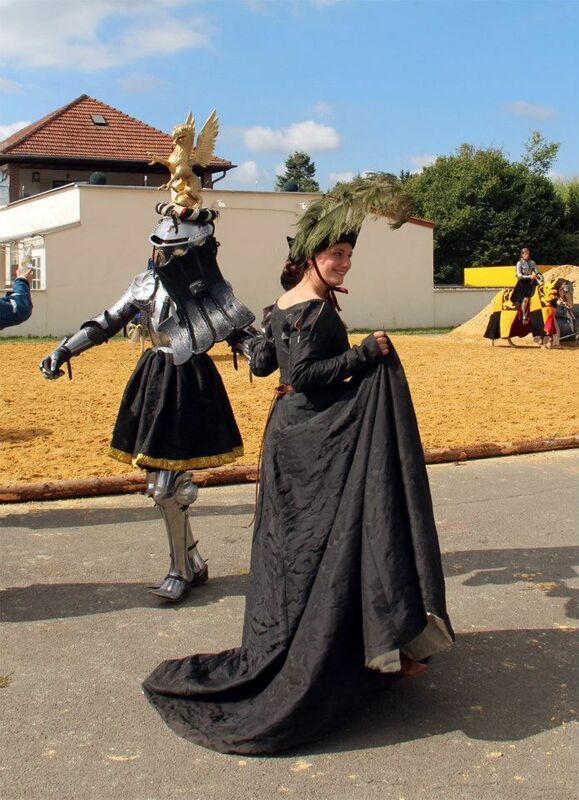 How did you become involved with “The Grand Tournament of Sankt Wendel”(GTSW)? 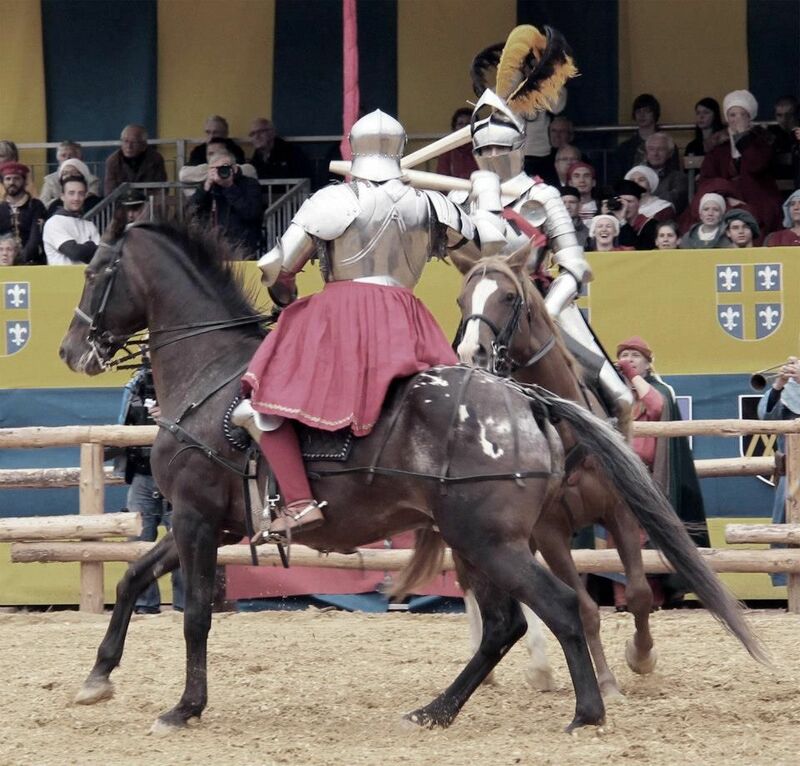 Pelle: I was introduced to the top level of jousting through Luke Binks, who lives with my stepdaughter. He thought my skills belonged at this level, and had me meet Arne Koets – the hub of the wheel that started rolling at St. Wendel. Pelle: My horse is named Hugo. He is a mixture of unfitting blood, but his Knabstrupper ancestry luckily shows in the spots on his bum! He is the first horse I have owned, and he's been with me for 9 years. He is a thoroughbred at heart, and really dislikes fighting. However, he is very maneuverable, and very strong in his hindquarters. My friends tell me he is a nightmare to ride under difficult circumstances, and I am afraid I would have to agree! Still, he performed very well during this event, with only a few troublesome moments. Pelle: The thing that made the biggest impression on me, was the Norwegian flag over the arena, actually. However, I would like to point out that I have rarely enjoyed the privilege of being involved with so many strong personalities, without anyone beating their chests, or standing out more than the others! None were invisible, and none seemed to think themselves above anyone else. 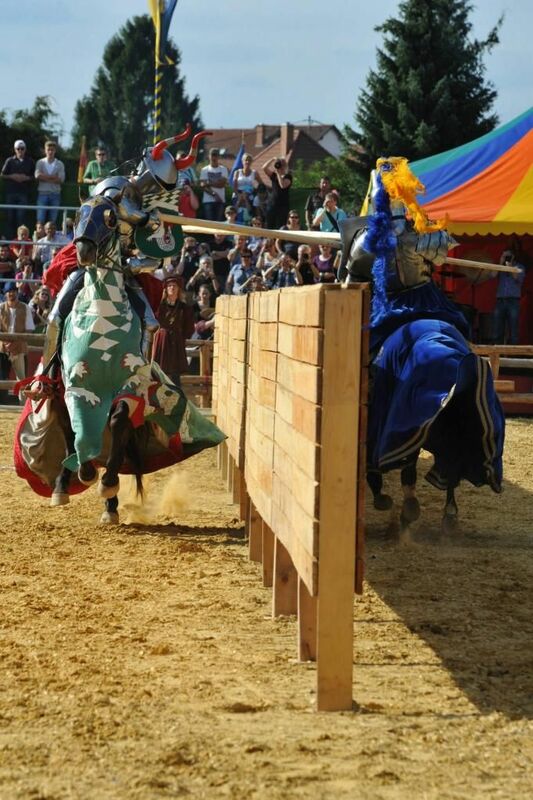 Please describe one or two(or more) of your favorite moments during the competition of “The Grand tournament of Sankt Wendel”. Pelle: I have three favorite moments, I think. First, the immense disappointment when Joram van Essen got injured, and I thought I would not be allowed to joust: I think that match has the potential to be epic! This was followed by huge excitement when Petter Ellingsen accepted the challenge and would risk head- hits in the heavy division! I feel we delivered a joust worthy of Vikings, and I actually shed a tear of relief: this is only my fourth tournament, and I was not sure I belonged in this crew, so please forgive my sentimentality! Second, or first, I cannot rank these: the last melee, with Joram – the human tank – keeping my back clear with many opponents! Totally epic to be a part of! The feeling of having a true knight protecting you so well, that you can utilize whatever ability you possess to really clean the field, is beyond my ability to describe! 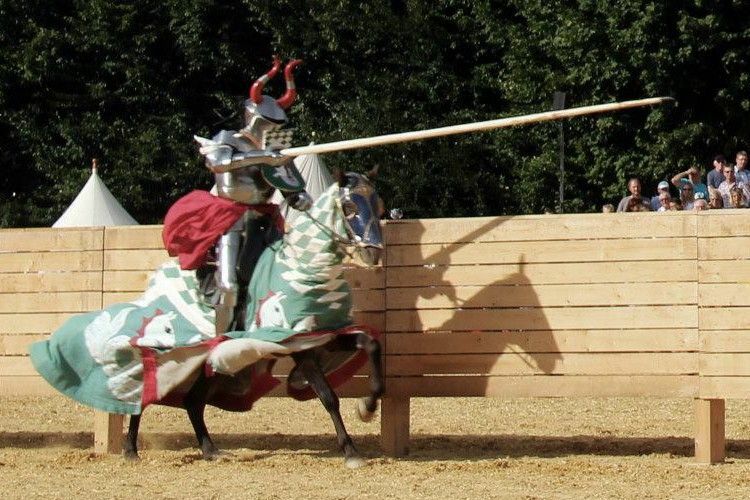 Also, I encourage every competitor to closely watch how Luke Binks NEVER takes a cheap shot in the joust. He does not, in my opinion, jeopardize safety for points. And that is knightly too. Arne Koets was chosen by the Ladies' Jury as the “Winner of the Prize for Highest Bravery”. Why do you think he was chosen? Pelle: It is obvious to all why Arne was chosen: he did, as many have stated, lots and lots of stuff to NOT put himself forward, and rather promoted those he felt deserved it. This resulted in the ladies choosing him as the bravest! Pelle: It is my understanding that Andreas did very well with a horse that is not very easy to work with during the tournament. As a horse-trainer and riding teacher, I can very much relate to the challenges such a horse puts upon his rider, and the ladies made sure to award him for his hardships! Pelle: The points exchange was, in my opinion, un-important! 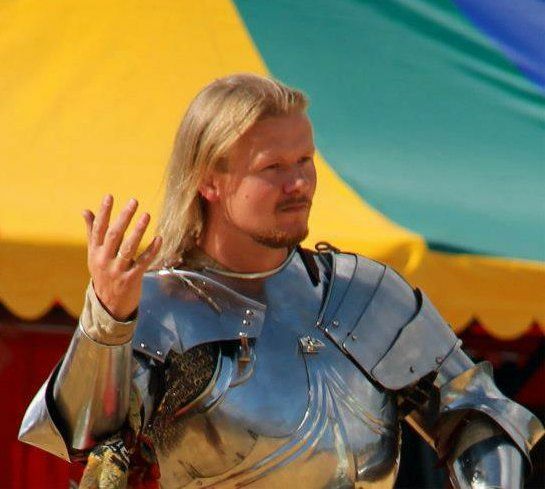 Chivalrous deeds rarely need points attached to them in order to show clearly, and if anything was clear in this tournament, it was that Joram van Essen was the most awesome competitor! Arne Koets made sure that there was no doubt about this, by giving away points the ladies had awarded him. Pelle: The squires and ground crew were impeccable. 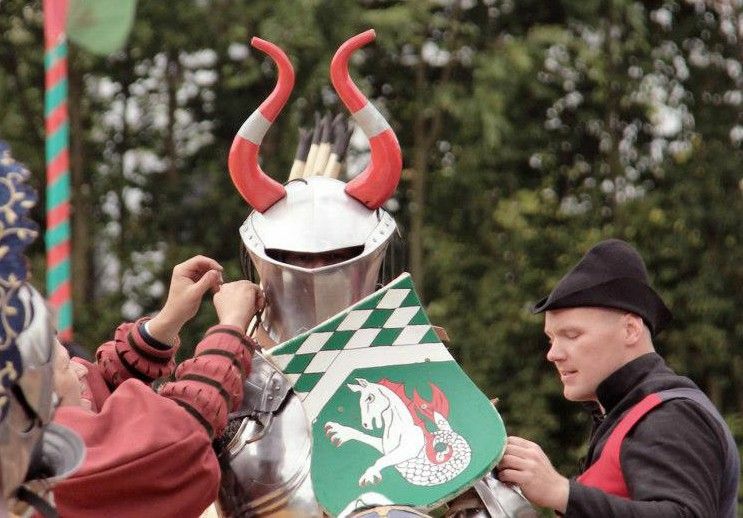 I never had to doubt anything about my horse being ready, thanks to Rozemarijn[Editorial note: Rozemarijn also provided many of the pictures for this article], and I was taken so well care of by Jack, that I hardly ever had to even spare a thought for my armour or weapons. Impeccable, and a fair bit awesome in itself. It is not easy caring for a stressed-out adrenaline-junkie with a half-mad horse. Pelle: To the organizers: DO IT AGAIN! Pelle: Overall experience: I WANT MORE!